This was billed as a pitchers’ duel and, in its way, it was. At least Matt Buschmann showed up for the gunfight. His opponent, the Chiefs' A.J. Cole, decided to commit suicide after the first three innings. I don’t know that I’ve seen a pitcher come so thoroughly unraveled as the Chief’s Cole did in the 4th. After getting a pop-up from J.P.Arencibia to start the inning, he then proceeded to walk the next five, count ‘em, five batters to drive in two runs and leave the bases loaded when he was pulled out at last. And they were not close calls, by the last three BBs the pitches were unreachable by the batters. A ground out by Ryan Brett scored the third run, before the inning ended with another ground out. And to be clear, the Bulls were not hitting all night. In fact, the team only had 1 hit (by Juniel Querecuto in the 3rd inning) in 23 ABs. That’s a batting average of .043! Throw in the walks and hit batsmen and you get an OPS of .356. Not the worst of the year, but still less that half the league average. 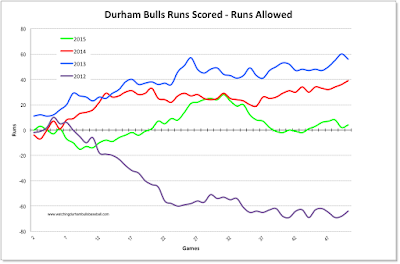 Speaking of hit batsmen, the Bulls' Brett was hit, but Buschmann and Romero combined to hit three Chiefs for a season high. We are beginning to expect a solid performance from Matt Bushmann, and we got another one last night. His Game Score of 70 is his fourth +50 start in a row and his 8th of the year. He has had only 2 starts with a less than 50 GSc. Enny Romero is back and showed up in long relief after C.J. Riefenhauser got in his one inning of rehab. Romero had no walks and 4 Ks. And a lot of heat. Several 97 mph fastballs in the mix, but it did take him 50 pitches to get through his 2⅓. Ronald Belisario got his 11th save with a three-pitch, two batter appearance. Mikie Mahtook’s 3 strikeout, 0 for 4 night just adds to our worries about the young man. He looked just fine in right field, but May has been ugly at the plate. In his last 44 ABs he has had 19 strikeouts and no walks. In fact, on the year he has drawn just 9 walks and only 1 this month. Yet, from the stands, he does not look all that awkward at the plate as hitters in slumps often do. As with much of the rest of this team, hitting coach Dave Myers has some work to do. Everett Teaford has been sent down to Montgomery. The weakest of the Bulls starting crew, we wish him well. Ryan Brett officially came off of his rehab assignment. As we saw, he was in the game at 2B last night. Like essentially everyone else, he was hitless last night, but he did get an RBI as he drew one of the 4th inning walks. 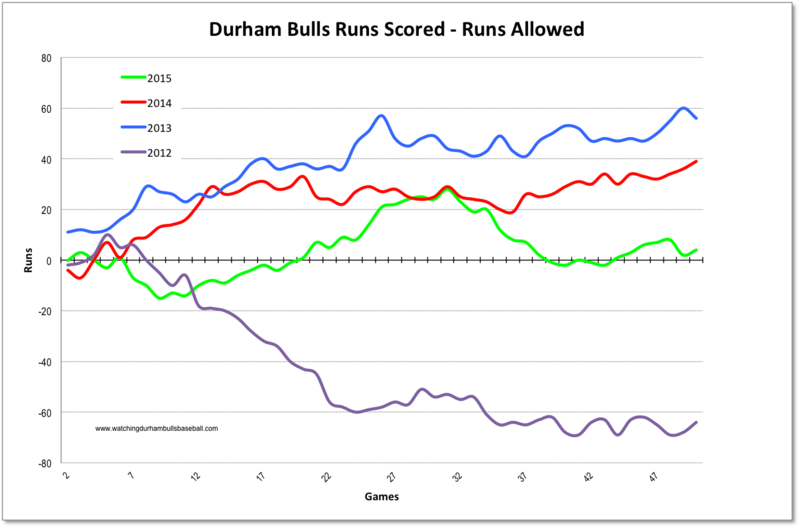 Fifty games into the season, how do these Durham Bulls compare to previous teams? By the net Runs Scored measure, only so-so, but much better than the 2012 gang. Considering all the roster turmoil and injuries, things are doing better than might be expected.